I never would have thought I'd get art for the laundry room. But given how much time I spend in there it is totally worth it. 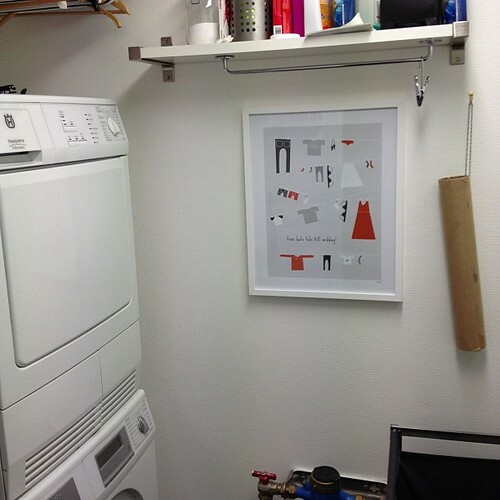 I bought the print from Swedish designer - Isa Form. She lets you customise the prints with your own phrases, so I picked "från halv tolv till middag" which in translation means "from half past eleven until noon" which is what my grandfather used to say to me when I spilled on my clothes. "You can't stay clean from half past eleven until noon." The frame is Ribba from IKEA - I love that frame. Nice and chunky. When we redo the laundry (which I hope will be soon) I'll hang it on the wall that is behind our dryer now. It is a little low for my liking right now. The brown tube on the right is our battery recycling collector.